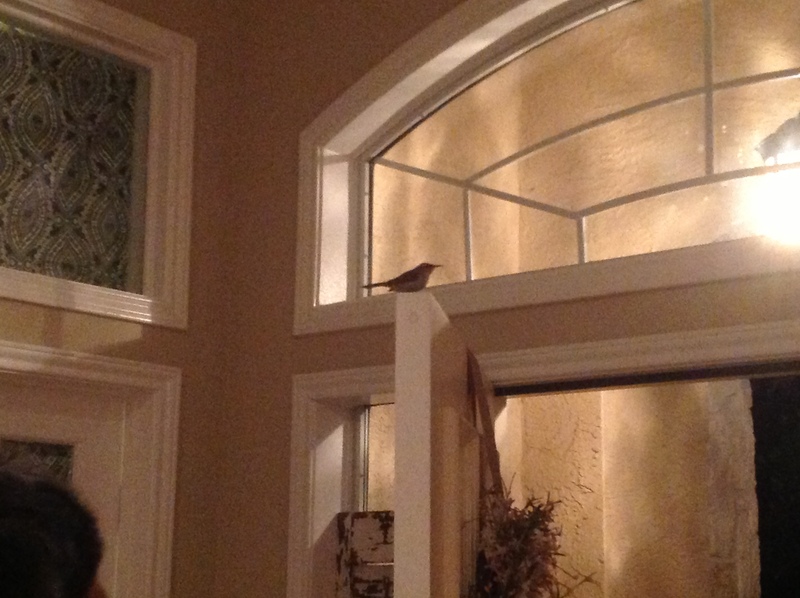 Just the other evening the little bird, pictured above, managed to find its way into our house. It’s not the first time we had a little winged friend take a wrong turn into our house…it’s actually the second. You’d have thought it was an overgrown grizzly bear-by the sound of my screams. As it fluttered, in fear, around our house-I ran to and from screaming (in fear). It was clear to me that the little bird was scared–he knew he didn’t belong in our house. He knew where he had been, moments earlier, was a far better fit for his lifestyle! You could really see the fear in the way he bounced around our house. We tried desperately to shoo the little guy out the front door. It was wide open…waiting to usher the little bird back to where he belonged. Eventually, after many failed attempts on both our parts and minutes that felt like months, he flew out the front door. As I was cleaning up the fallout of our bird fiasco, I couldn’t help but think about how gracious God is with us. He tends to our needs. He directs our paths. He leaves the front door of mercy wide open-and too-waits patiently for our decision. Scripture makes it clear that if we first seek Him, He will take care of our needs. I take a lot of detours in my walk. I journey into relationships that I don’t know how to navigate, say things that don’t bring life, harbor emotions that lead me away from grace, and worry about issues outside of my control (aren’t they all?). I have a master’s degree in worry. Yet, scripture addresses this frame of mind often…and each time with the same phrase, “do not worry“. Worry robs my life of proper perspective, and puts my ability to trust on the balance. That cute little bird just needed to trust that we were “shoo”ing him in the right direction. We wanted his good all along. How much more so with God? Today, in spite of my limited perspective, I choose to trust Him. To wait and watch for the open door, and to walk along in hope because He cares for me. Previous Post Letting Go and Falling…Forward? Love it, my friend. I need to share my bird story with you. I’m going to share this with Inside Out. Phenomenal! Those flying grizzly bears can make me crazy. But “worry” can really make me crazy. Loved the word picture and the message! Thank you for this. It is very timely. I have had a difficult two weeks. Car problems, finances (child support, Insurance issues, High electric bills), time management. I had a single mom(unemplyed) with three girls living with me. BAD Choice! I did not pray about it first. I just wanted to help. I had to ask her to move out last Tuesday and I found it so difficult. I know she is not my concern. She is God’s. I need to ask God first. I make my own mess and then expect Him to fix it. I have learned not to do this anymore. I am learning. I just do not like that it affects my children as well. I need to stop. Please continue to pray for me. Thank you and miss you! I so needed this today, thank you. Alyssa, just the message I needed to be reminded of. Thank you for following God’s lead!